After the meal, one of the air steward penguins took me to the front of the airship to meet the pilot in the cockpit. 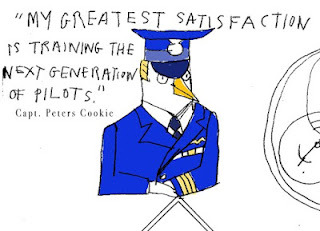 He introduced himself as Captain Peters Cookie. 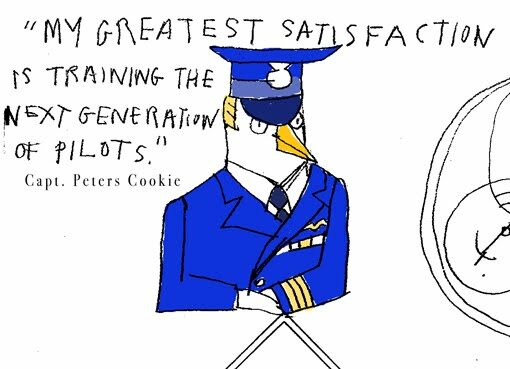 He was eating a pancake while his co-pilot, Lieutenant Montblanc was flying the airship - actually she was busy steering around and between some icy mountain peaks. She was concentrating like crazy, trying not to crash into the icy peaks and she didn't even say hello. I don't think she realised I was there in the cockpit. Capt. Cookie said we would soon be making a brief stop at a small port in the mountains, and everybody would be getting off to stretch their legs, feet, flippers etc. and to have something to eat and a drink (hopefully without a slightly fishy odour). After that the airship will be continuing it's flight to the penguin homelands in the Far North (with me, accidentally, on it).